I recently visited the Queens Botanical Garden in New York and thought they did a great job creating visually appealing sites to educate all who tour the gardens. The intent is to teach others to be stewards of the environment by integrating sustainable elements into the landscape. Some of the impressive features include: a green roof that visitors can walk upon atop the LEED platinum visitor center, bioswales and constructed wetlands, a gray water system and the fountain & water course (pictured above) which capture rain water that birds love to flutter about in. Even the parking lot is sustainable! BIOSWALES are low-lying areas that collect and retain rainwater runoff from surrounding areas where it is absorbed by plants and infiltrates back into the water table. Bioswales help prevent the overflowing of combined stormwater/sewer systems, therefore reducing the polluting of our waterways. Outdated combined wastewater systems are common in many cities. THE PARKING LOT features permeable paving and a bioswale between parking aisles to help manage stormwater runoff and reduce the urban heat island effect. 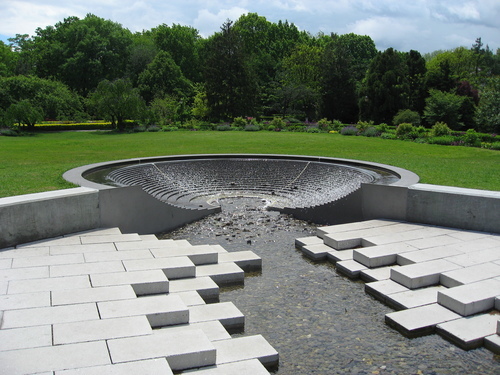 Learn more about sustainable landscape architecture from the Queens Botanical Garden.